Buton eBusiness Solutions together with its global supply chain software partners provides best of breed supply chain solutions in almost all possible stages of an enterprise commerce scenario. HighJump Software is a global provider of a full suite of supply chain management software that streamlines the flow of inventory and information from supplier to store shelf. HighJump supply chain management software manages the flow of inventory and information from supplier through manufacturing, distribution and EDI solutions all the way to direct store delivery. More than 4,500 customers worldwide have transformed their supply chains using HighJump Software. Gartner reports that HighJump customer references call attention to HighJump’s flexibility and willingness to establish a partnership-type relationship with customers. Space, inventory, equipment and people. Optimizing your distribution operations requires you to effectively manage all of these important resources. Selecting the right warehouse management system (WMS) is imperative to keep inventory moving and customer shipments on schedule. We provide the means to ensure fast, accurate fulfillment through directed, optimized workflow. The HighJump™ WMS manages some of the most highly-regulated and complex distribution environments in the world. 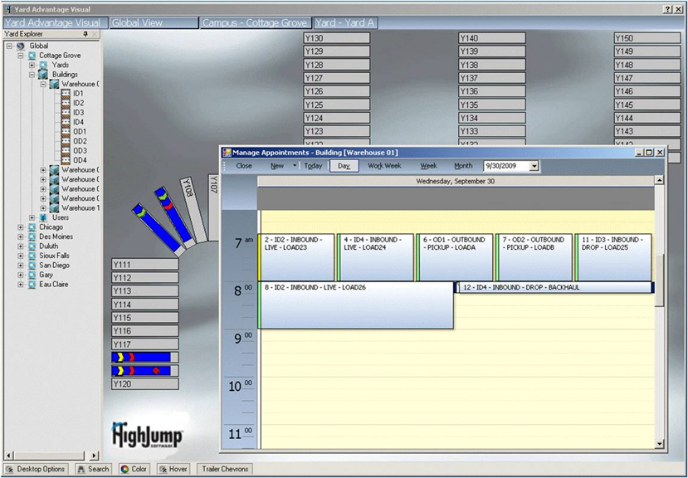 The HighJump™ warehouse management system gives companies across industries a foundation of best practices for receiving, put-away/flow-through, inventory management, order processing, replenishment, pick/pack, loading and shipping, as well as the ability to build their own company-specific businesses processes using our adaptability tools. HighJump™ Software offers full support for your multinational facilities and supply chain processes. HighJump operates in multiple geographies, which gives you the assurance that both your domestic and international operations can be effectively supported. HighJump Warehouse Advantage has been fully Unicode-enabled and ships with nine languages, including English, Japanese, simplified Chinese, Czech, Spanish, French, Italian, German, Dutch, Portuguese and Turkish. While the robust standard functionality of HighJump Warehouse Advantage incorporates industry best practices, HighJump also empowers you to go above and beyond typical business processes by building your own unique workflows into the system. HighJump Software’s core architecture enables you to easily adapt the system to meet your specific needs—without the use of custom code—in a fraction of the time of conventional systems, and at a fraction of the cost. And because all changes are external to the core software, upgrades and support are not compromised. This helps keep total cost of system ownership low. HighJump™ Performance Advantage combines the latest graphical dashboarding technology with industry-developed standards to produce real-time and comparative dashboards using your own data from your HighJump system and other business systems. This can empower your team with timely, meaningful information to enable significant process improvements. The HighJump manufacturing execution system (MES) is built to meet the challenges of discrete, multi-step operations in both work order & demand driven manufacturing environments. HighJump’s MES bridges the disconnect between the traditional MES and warehouse management system (WMS), enabling optimal inventory flow throughout the shop floor. The HighJump MES coordinates key aspects of production, including resources, materials and schedules. Planners can easily dispatch schedule changes to the shop floor electronically, eliminating the time, labor and errors associated with paper-based distribution. Once released, work against the schedules may be viewed and managed in real time by planners, supervisors and management. HighJump’s manufacturing execution system allows you to leverage shop floor touch screens running a Web browser to streamline the flow of critical information and simplify the reporting and viewing of information in real time. HighJump Software’s single, all-inclusive Web user interface electronically links documentation and work orders directly to the shop floor. Our shop floor employees have immediate access to drawings, quality control documents and process preparation guides. Because of its simplicity and intuitive design, the shop floor touch screen enables rapid learning and lowers employee training costs—not to mention quick and easy upgrades for the IT team. The HighJump MES provides the shop floor execution and visibility needed to effectively deal with complex genealogy and traceability requirements. Using data from the automation layer or transactions from shop floor workers, the system ties lot numbers, serial numbers or other data to the appropriate finished goods, as well as back to the work order or demand signal. The robust data model and transaction history enable a variety of Web-based reports for viewing unit histories, genealogies and part traceability. Acquiring quality data and interpreting results are key aspects of creating products that meet your stringent standards. The HighJump manufacturing execution system (MES) allows quality management to track product quality levels, and if necessary, quickly implement an updated quality plan to further refine the test result data being collected. HighJump™ Labor Advantage, gives you the ability to plan, measure and track labor activities within your organization to increase efficiency. Objectively measure employee performance and identify those whose performance consistently exceeds the standard, as well as employees who need assistance. The HighJump LMS enables you to create individual performance standards, enabling each employee to see what is expected and how he or she is performing against that standard throughout the day. Warehouse management efficiency has a direct correlation to inventory optimization throughout the supply chain. Accomplishing this requires you to truly maximize inventory flow not only inside your warehouse, but also as inventory enters and leaves the yard outside. The HighJump™ Yard Advantage yard management system (YMS) provides real-time information, intelligent work direction and complete visibility of trucks, trailers, drivers, goods and materials—from the moment they arrive at the gate to the moment they leave your facility. With a graphical interface, you can manage yard transactions easily. Drag-and-drop functionality converts on-screen trailer moves into RF-directed work for yard drivers. At-a-glance symbols display key information such as trailer type, status, disposition, ownership, which trailers are damaged/out of service, and fuel remaining in refrigerated vehicles. Track the location of trailers and other equipment—no matter where it ends up in the yard—with RFID-based, real-time location tracking. This ensures security and streamlines workflows by providing you with the actual position of equipment in the yard, eliminating time-consuming searches for misplaced trailers. Additionally, dynamic appointment scheduling capabilities will streamline dock assignments, helping to ensure you don’t double book docks—even if circumstances change at the last minute. Your ability to meet customer demand is directly determined by your suppliers’ ability to deliver. But you are likely facing a continuous battle with extended cycle times, material shortages, unplanned receipts, high inventory and transportation costs, vendor compliance issues and difficulty reconciling invoices. These problems could be resolved by having system-to-system communication between you and your suppliers using supplier enablement software. HighJump™ Supplier Advantage supplier enablement software empowers you to dramatically increase the speed of receiving operations, lower inventory levels and push work such as labeling to your suppliers—whether they're around the corner or across the ocean. A secure Web portal provides the basis for real-time information sharing and improved inventory visibility, critical factors in enhancing collaboration and streamlining supply chain operations. Achieving and maintaining collaboration between your distribution center and your supplier network reduces cycle times through real-time communication of demand, order status and potential exceptions. HighJump Supplier Advantage also incorporates robust event management functionality to promote proactive issue identification and resolution. This reduces costs by alerting managers and suppliers (via e-mail, pager, fax or phone) to supply chain events and exceptions.